Twisted 2014 or Happy New Year! – Go ask Alisa – DIY capsule wardrobe one stitch at a time! Twisted 2014 or Happy New Year! As I am treating myself with another spoon full of vanilla-pecan-chocolate chip ice-cream, home made by the way, I realized that having no plan can be a pretty good plan on its own. Not to mention how bizarre and bonkers it can get! Well, I might be slightly exaggerating. With one of the worlds most impressive New Year’s Eve fireworks, being in Las Vegas is a plan already. Check out all the other amazing firework places in the world – http://www.huffingtonpost.ca/2013/12/31/new-years-eve-fireworks_n_4522277.html. Sometimes it simply makes no sense to bother your head with attending some special event, when you already have such a wonderful show above your head, lighting up the skies with thousands of fireworks. We got to the Strip hour and a half before the traditional countdown and decided to check out the legendary -5 Bar at the Monte Carlo. Yes, I was silly enough to complain that there wasn’t a single snow flake this winter in Las Vegas. So, New Year’s eve seemed like a perfect occasion to freeze my toes off and get loaded with two ice shots. Everything in -5 Bar is made out fine Canadian ice (yes, Canadian) – the walls, the bar, the tables, the seats and even the shot glasses. How cool is that? FREEZING! Check out our photos over here. 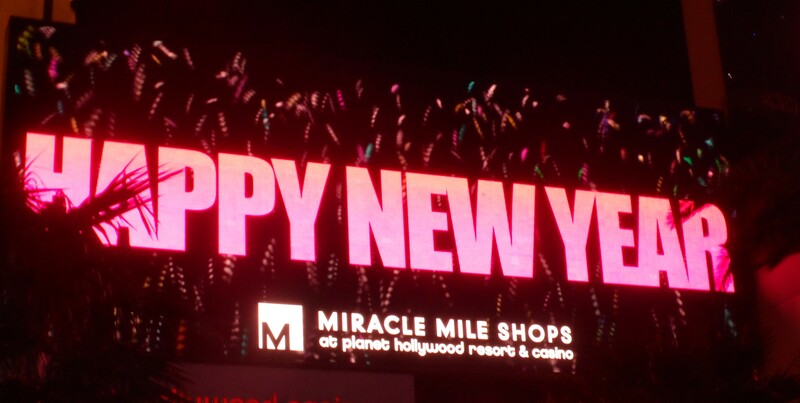 With that being the last thing to check off of our “to do list of 2013” we headed back to the Planet Hollywood to witness 88 000 fireworks light up the skies from 7 rooftop locations after traditional countdown to wave goodbye to 2013. It was simply A-M-A-Z-I-N-G! There is definitely something enchanting about fireworks, moment of pure magic and expecting miracle of the midnight to bring new hope and fresh beginnings! It truly was the best New Year so far. All the weirdness of being sandwiched up with thousands of people on the Strip made it even better. It seemed like we would never get out of there, what usually would be a 7 minute walk took us 45 minutes to get through. Elbow to elbow, everyone was pressed up against each other and yet once in a while there was still that one awkward person who would randomly hug you and wish you a Happy New Year! That moment when it feels that everyone is united no matter what. Everyone was saluting the same values, same feelings, love and freedom for that one brief moment – the New Year’s night. We did have some greater plans to enjoy the night through on the Strip, but “oh boy!” it was PACKED! Like really PACKED. With 2 hours spent on the move we decided to warm ourselves up at the local TGIF (of course) at the Gold Coast. Two cocktails and an appetizer later we were ready to unwrap our presents that were patiently waiting for tonight. Having no plan turned into the best night ever! More pictures will be uploaded later!!! Previous Previous post: Retrospective of 2013. Unexpected and fickle. Next Next post: Photos from The Strip. NYE. Welcome to 2014!